I am preparing to install SQM-LU-DL and want to keep in shielded from surrounding street lights. If I can place the device with weather housing in a larger container to block light from entering from the sides, there will be more location options for placement. Would this interfere with meter readings? You should ensure that your shield does not interfere with the light coming in to the meter from the sky above. 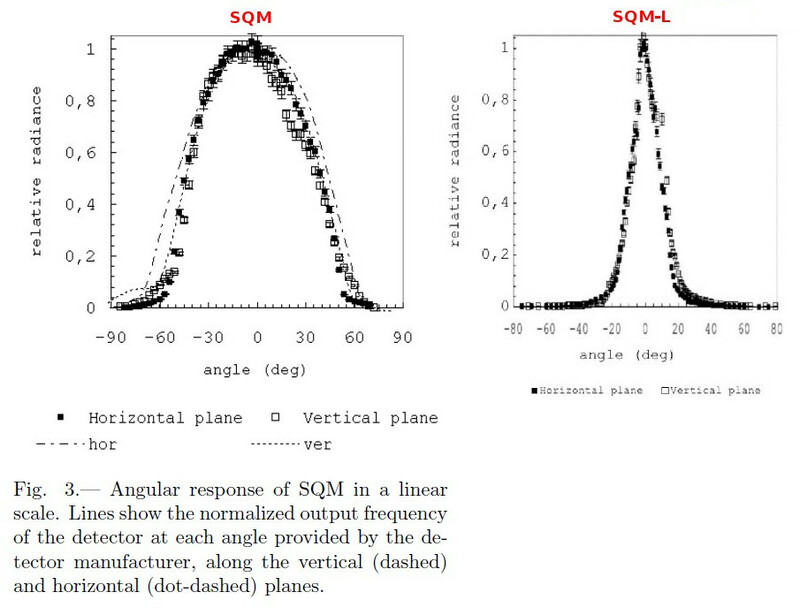 While the Full Width Half Maximum (FWHM) is ~20°, the unit is still sensitive to light at +/-30° or 60° (as can be seen at the bottom of the right hand plot). You can also set the meter (and housing) on an angle to point to a part of the sky that is free from artificial light and obstructions. Something like that might work, but I would caution that you be careful, because depending on how you did it, you could potentially see light from the streetlamps reflected by the collimator surface. However, it should be emphasized that the results will be different, that is darker, than what you would get with an SQM at the same location (assuming you could turn off the nearby lamps). Depending on what you are trying to do, that might be ok or problematic. I would strongly recommend against tilting the SQM unless you can very accurately re-position the SQM after taking it down for cleaning/etc., and that you record the tilt angle in the metadata.